If you like to take a whole lot of outdoor pictures until your battery dies and your neck ends up beat red, then this is the camera strap for you. It actually uses all that power the sun usually is using just to give you a nasty sunburn and charges your camera with it. 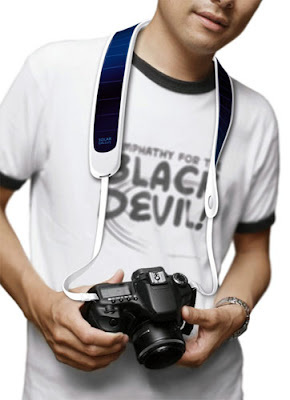 The whole strap has a large flexible solar panel on it that’s just waiting to soak up a little sun. This design was created by Weng Jie. It could be used for those times when you need power for big events and don’t happen to have a spare battery handy. You could even just lay it out in a window when you’re not taking pictures to charge it up other times. Sadly, right now this is just a concept design, so it can’t be purchased just yet.